I'm happy to announce to BEST has finally released some results it gets without adjustments. It's not a full release, but it's still a significant step forward, so for today I'll try not to be snarky. I'll try not to dwell on why they've waited years to release this data, why they falsely told the media they had already released the data, why they refused to correct their false statements or why they now still don't talk about it. I've talked about all that before. You'll note, the scale of the map begins at 0. That's because there isn't a single point on it below zero. 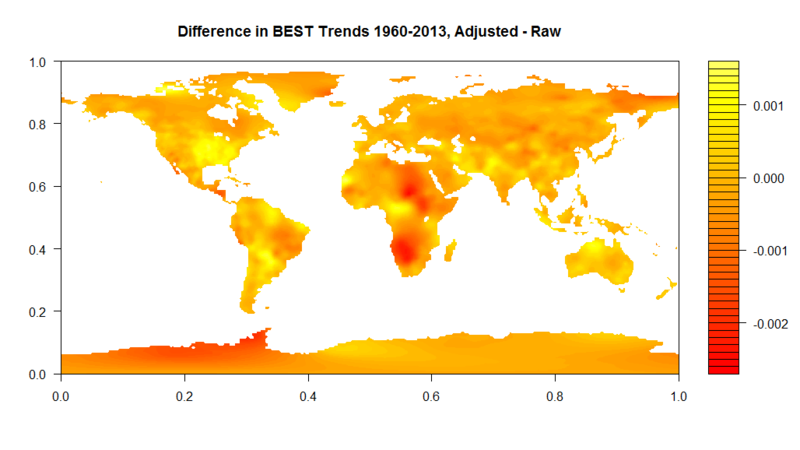 According to BEST, not a single location on the planet has cooled since 1960. Since I wrote that almost exactly a year before I gained access to this new set of results, ones generated without adjusting the data, obviously I have to try doing the same thing with them. Before I get to that though, I want to point out these images line up with one of the images BEST has published showing unadjusted result, which is always a good sign. As for the differences, this shows BEST is not simply adding a bunch of warming to its record willy-nilly. As everyone should have already known, global warming is not purely some artifact of adjustments. On the other hand, the difference in spatial resolution between these two images is remarkable. 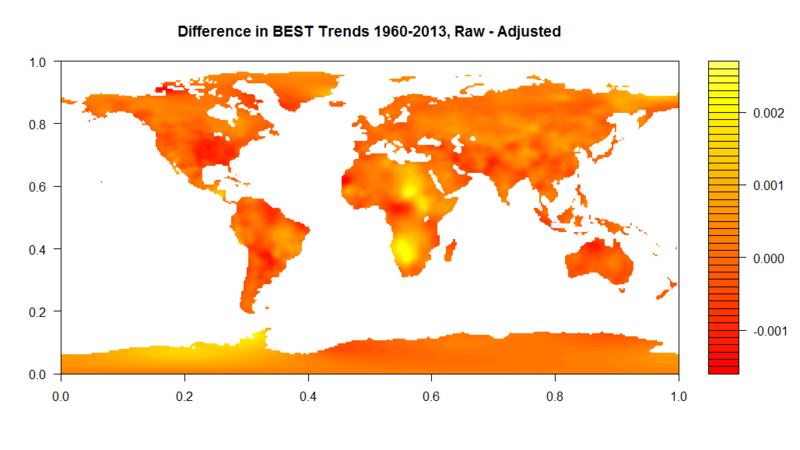 The rate of warming in the unadjusted results varies quite a bit across continents, but in the adjusted data results, it is far more constant. It’s amazing. From month to month and year to year, GISS and BEST look nearly identical. The high frenquency components of their graphs are indistinguishable. The only meaningful differences between the GISS and BEST estimates for my area is BEST adds a huge warming trend. To be clear, I don’t think this means BEST is fraudulently adjusting the data. I’m not Steven Goddard. I suspect what’s actually happening is BEST is smearing warming from other areas into mine. That is, warming in other states is causing Illinois to seem like it’s warming far more than it actually is. That’s not fraud. That’s just low resolution in the estimates. But here’s the thing. BEST is supposed to be the best temperature record. It has a website encouraging people to look at data on as fine a scale as individual cities. WHY?! If BEST can’t come close to getting things right for the state of Illinois, why should anyone care at what it says about the city of Springfield, Illinois? In any event, I'll be looking at this data more in the days to come. I'm not posting a direct link to it though, as it stored in a location with some data for an unpublished paper, and I was asked not to access that data. I'd feel wrong if I gave a link to this data and someone wound up accessing the other data because of it. I'm still baffled they haven't released this data publicly despite all their promises, but... as I said, laying off the snark for today. Anyway, until the data is publicly available, if there's anything you'd like me to look into, feel free to let me know. One thing I'm particularly interested in right now is how adjustments vary over time. I'm happy to look at other things though. It would be nice to have a difference map and overlay the national borders. Comparing the two graphs, I have the feeling that Angola introduced a large change in its measurements system during this period. Maybe in a difference map one would be able to see more borders, even if the Berkeley Earth fields are very smooth. "You’ll note, the scale of the map begins at 0. That’s because there isn’t a single point on it below zero. According to BEST, not a single location on the planet has cooled since 1960." That is not what the map means or represents. There well may be single locations that have cooled. I could make a difference map very easily. I'm not sure about the national borders thing. I know I could combine these gridded files with map data to overlay the national borders, but I'm not familiar with the map packages for R at the moment. It might be easy, or it might not be. I'll have to look into it. Um, no. That's exactly what it means, when we're talking about BEST's gridded results. Or BEST's any results. 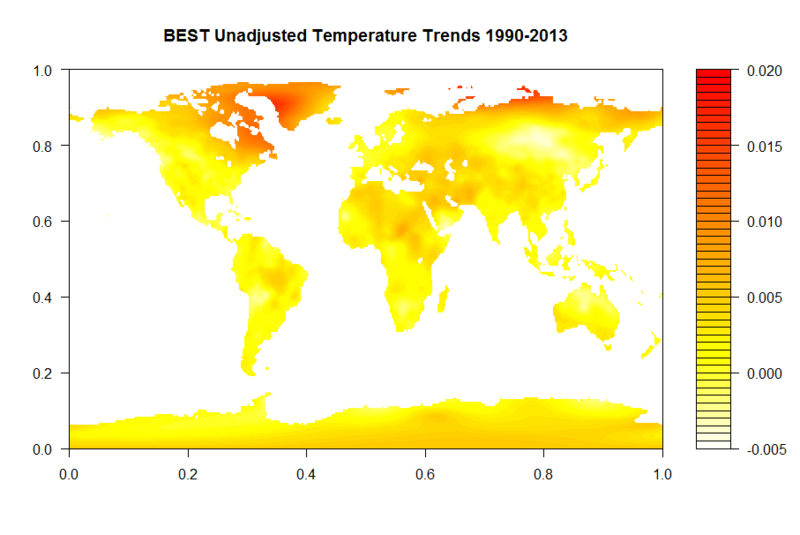 As far as BEST's results predict,* no location has cooled since 1960. That you can point out those predictions are wrong does nothing to defend BEST; it simply emphasizes the point I'm making - BEST's predictions for individual locations do not match what people would expect or find useful. *Feel free to replace the word predict with project, interpolate or any other word that you feel fits better. Could you do the last 2 maps from 1990 on? That I can Armando. I'm going to create a difference map for Victor Venema first, but I should be able to get the others done shortly. I'm running a bit behind on things because of technical difficulties. My phone's charger port died on me a few days ago so I haven't been able to use it. Normally, that wouldn't be a problem, but I use it as my backup internet access point. Naturally, my wireless router decided to die a couple days later. That left me without internet for about 30 hours. The timing of it was very strange. Anyway, I found out there are a number of map packages for R that are pretty easy to use, but I haven't found an easy way to overlay them with these maps. I like these contour maps, but because they're generated in a kind of weird way, it turns out they're hard to make work with other things. Even just altering the axes and information plotted along them is a pain. Overlaying things seems out of the question. I should be able to make the maps a different way, but that's more time I have to spend finagling with graphics instead of something more productive. But yeah, I'll start running that code now. You can see there are large areas with significant warming/cooling trends added to them. Look at the eastern half of the United States, or practically anywhere in Africa. Actually, here, let me change the color scheme. I don't think the neutral (0) color stands out enough in these maps, so the visual effect may not be as clear as it could be. Here is the Adjusted - Raw map again, with a different color scheme. 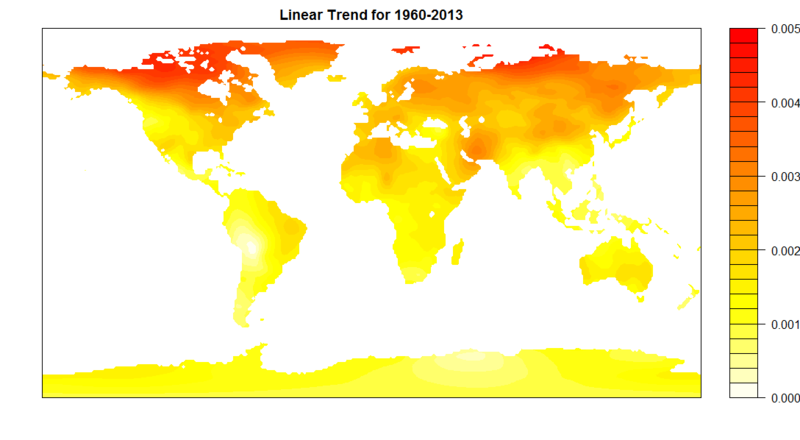 In it, blue is where cooling trends were added while yellow is where warming trends were added. I think it speaks for itself. I think I like doing Adjusted - Raw more than the other way around so I'll probably stick with that from here on unless anyone prefers I do the other (or both). I'm also going to go ahead and make these along with any other maps I make when I examine other time periods. If these sort of changes happen in a period with good data coverage, I'm curious what changes happen during other periods. I'll check Armando's 1990-2013 period next. Apparently I adjusted the dimensions of the maps between this set and the last one. I'm not sure when I did that. I should probably hard code those at some point. Oh well. It's not like I'm getting paid for this. Next up will be 1900-1950. After that I think I'll do 1950-2000 and 1850-1900. That should give a general idea of the effect of BEST's adjustments. After that, I can maybe look at details/tidying up images. We see a significant portion of the United States was actually cooled. 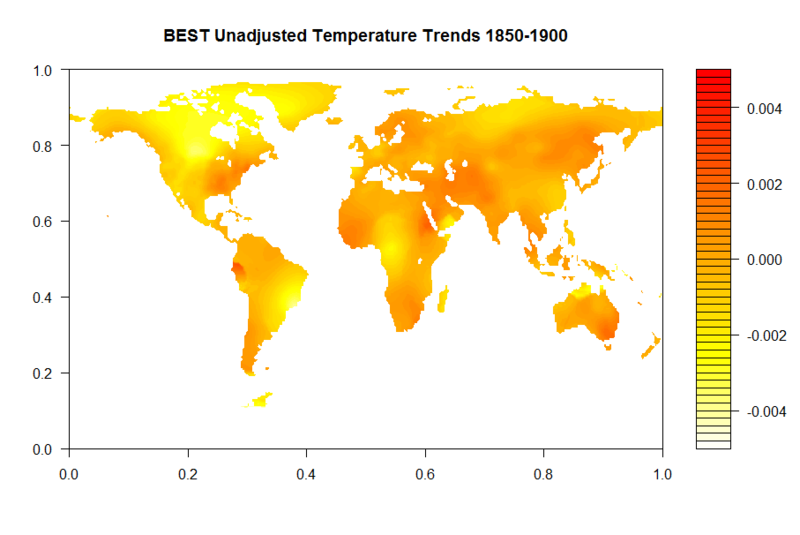 That means in the 1850-1900 period, a region was cooled, then in the 1900-1950 period when it showed warming, it was left untouched, then in the 1950-2000 period when it showed cooling, it was warmed. It could be coincidence, but that is exactly what I predicted would happen if BEST's adjustment process were biased due to it being little more than an overly complicated regression on an arbitrarily chosen time period. Ideally, what I'd do is create a new data file which was just a difference file of the two we currently have, then turn it into a movie. That would let us see how the data was altered by month rather than looking at how estimated trends change based on those adjustments. That'd be a lot of work though. I think what I'll try doing next is just examining individual areas in greater detail. I have to agree with Steve Mosher. 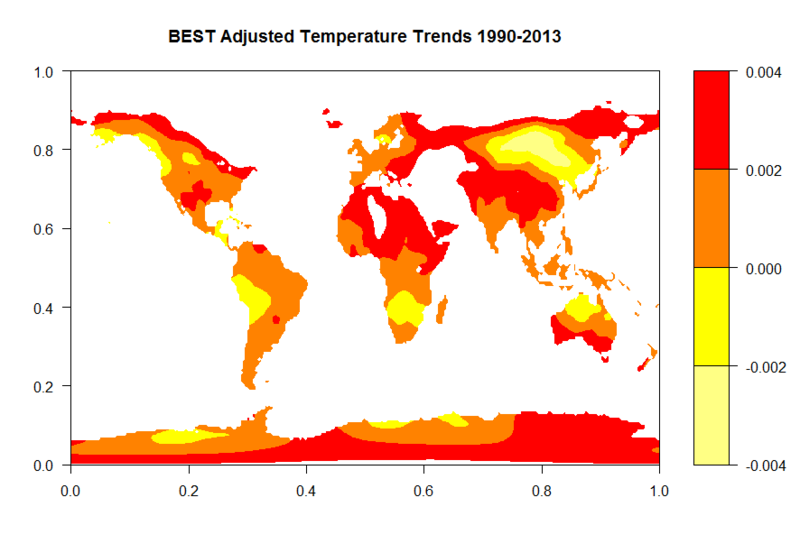 The temperature trend after homogenization is the temperature trend of the region. This region seems to be larger for Berkeley Earth than for other homogenization methods, but in all cases homogenization aims to estimate the regional climate signal not the local one. You’ll note, the scale of the map begins at 0. That’s because there isn’t a single point on it below zero. 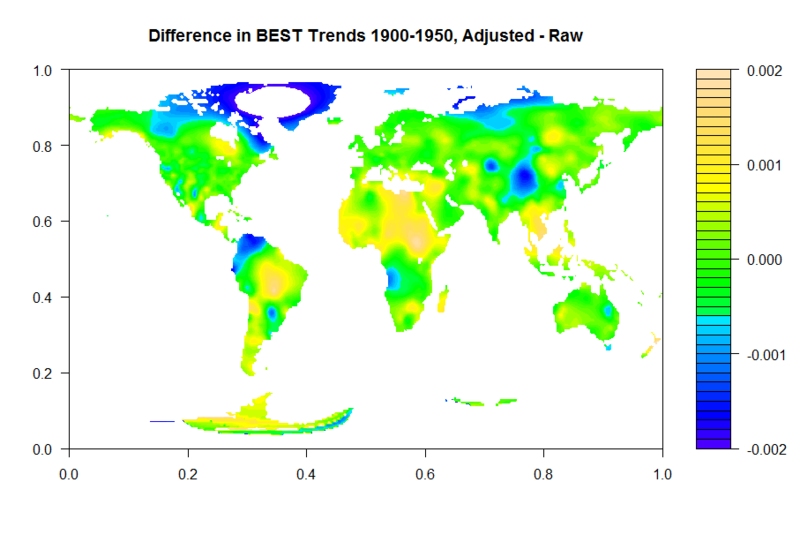 According to BEST, not a single location on the planet has cooled since 1960. Claiming that is only true because homogenization reduces the spatial resolution of the data set does nothing to rebut the point. All it does is add the qualifier, "At the scale the data can be resolved to" - a qualifier which ought to be implicit in all statements regarding the data set in the first place. But again, I'll point out BEST created a website which encourages people to look at its results on a relatively fine scale. Not only did it publish its results in 1x1 degree gridded files, it also created a website designed to allow users to select any location or even city to browse the temperature data for. By doing that, BEST portrayed its results to the public as having an incredibly fine resolution. Even if one thinks my statement was too broad because I failed to qualify it by explicitly stating the resolution in question (even though nobody else in these discussions ever does), worrying about that would be looking at the speck in my eye while ignoring the plank in BEST's. If you want to know what the temperature change has been in your city, your state, or even your country, you can now find this online at BerkeleyEarth.org" says Rohde. He adds, "We hope people will have a lot of fun interacting with the data." This feature should be available to the public by Monday, July 30. It's pretty cheeky for BEST to tell me I can look up "the temperature change" in my city on their website then turn around and criticize me when I refer to their results as being for individual locations rather than regions. And by cheeky, I mean... I shouldn't say more because I'm trying not to be snarky on this page. Yes, that quote at Science Daily is somewhat unfortunate, where a softening factor is that they are talking to the public. Better would be: "If you want to know what the temperature change has been in your region, you can search here by city. We also provide averages by state or country". As a variability freak, I read your "not a single location" as a claim about local temperatures, not about regional temperatures. Location is the smallest spatial scale. Somewhat unfortunate...? BEST has made the same sort of remark multiple times in multiple locations. It's explicitly stated it wants people to use its results for that purpose, actively encouraging people to use a tool it created to do so. And it's not like this is a matter of mixed signals - BEST has never said a single word to distance its product from that usage (unless you want to count the needlessly cryptic droppings of Steven Mosher like those on this page). If you really want to get down to it, BEST provided its results at a particular resolution. I discussed the results at that resolution. There's nothing wrong with that. If BEST doesn't feel its results can be resolved to the scale it provides them at, it should not provide them at that scale. It shouldn't complain when people discuss its results at the scale it provides them at. Victor, what is the status of the benchmarking of temperature data sets? Have you used the latest GISS numbers? There was a big change for the June numbers. Although it is in the change of ocean data, I wonder if they somehow smear that as well. They have now doubled the change from 1998 to 2014. Nope. I'm using the exact same data files I used last year. I only used GISS's land data last year though, so I doubt any change to the ocean data they use would affect things. They actually have two different gridded files up right now, one with the new ocean data and one with the old. I haven't downloaded either, but I suspect the land portion will be the same in both. GISS actually states how much they smooth (smear) their results (250km for land-only, 1200km when including ocean). I haven't checked it, but I suspect it's reasonably accurate. GISS definitely has much better spatial resolution than BEST does. By the way, I'm only using data up through the end of 2013. That's how far the BEST data went when I did the comparisons last year, so that's when I cut it off. I'm cutting it off at the same point now just to keep things consistent. The extra year or so of data shouldn't affect anything. Now if I had all the time in the world, I'd be look at the new ocean data too, but there are only so many hours in a day. I'm still looking to see how much difference there is in BEST's resolution on the horizontal as opposed to the vertical scale. I think there's a meaningful difference in how much BEST smears information depending on if it is north-south/east-west, but I can't quite pin it down. "Um, no. That’s exactly what it means, when we’re talking about BEST’s gridded results. Or BEST’s any results. 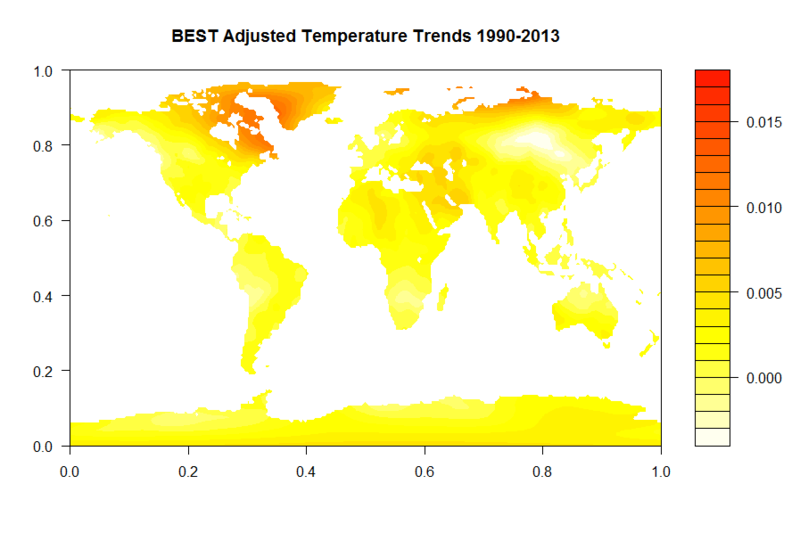 As far as BEST’s results predict,* no location has cooled since 1960. That you can point out those predictions are wrong does nothing to defend BEST; it simply emphasizes the point I’m making – BEST’s predictions for individual locations do not match what people would expect or find useful. *Feel free to replace the word predict with project, interpolate or any other word that you feel fits better." He is what a grid value MEANS. A grid value represents the best estimate for ANY random location in that grid. It is does NOT mean that no actual location in that grid has no cooled. So a grid value may be .1 per decade plus uncertainty. The uncertainty may of course include values that are negative. Actual locations may be negative. BUT the estimate that minimizes the error for all unsampled locations is positive. sample the unsampled locations you will find that the estimate that minimizes the error is postive. Brandon you have some pretty fundamental mis understandings of what the various data products are and what they represent and what purposes they are intended for. Lets just start with gridded data. When a grid cell has a value of X.. that does not mean that every location in that cell has a value of X. That's just fundamental. Instead of temperature suppose I gridded the weight gain of people in illinois and the average weight gain was 10 lbs per decade. Would that average for the state entail that every person had gained 10 pounds and that NO person had lost weight? Nope. It means "go sample a bunch of people in Illinois, and your best estimate of weight gain will be 10 lbs." That is what a grid cell MEANS. It doesnt mean that there are NO PEOPLE who lost weight. In spatial stats the value of the cell is the prediction of unsampled locations. and it doesnt entail that every sample will have the value of the prediction. In fact the opposite. Its highly unlikely that ANY location will match the prediction perfectly. The same way if I tell you the average weight gain will be 10 pounds.. you might find very few people with EXACTLY 10 pound weight gain, but 10 pounds will be the estimate that minimizes the error of prediction. Brandon, GISS's numbers for 2013 have changed substantially, at the global level. 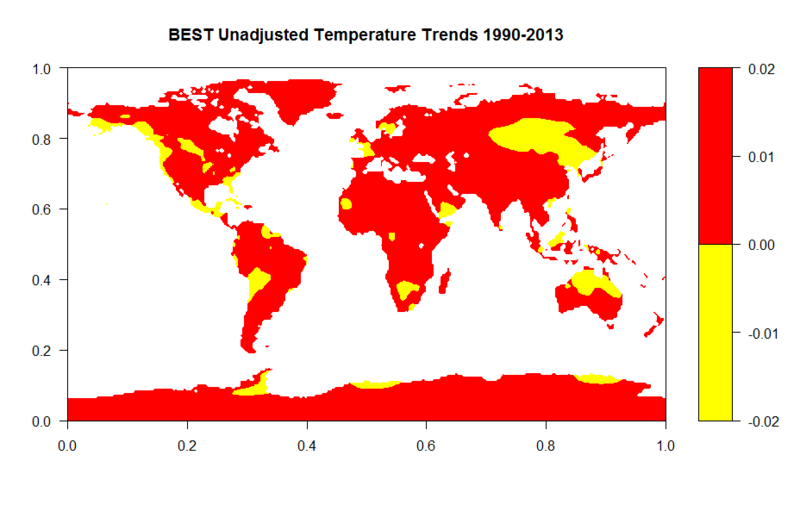 Land only has cooled about .01C every year compared to the last update, so no big changes like the oceans. 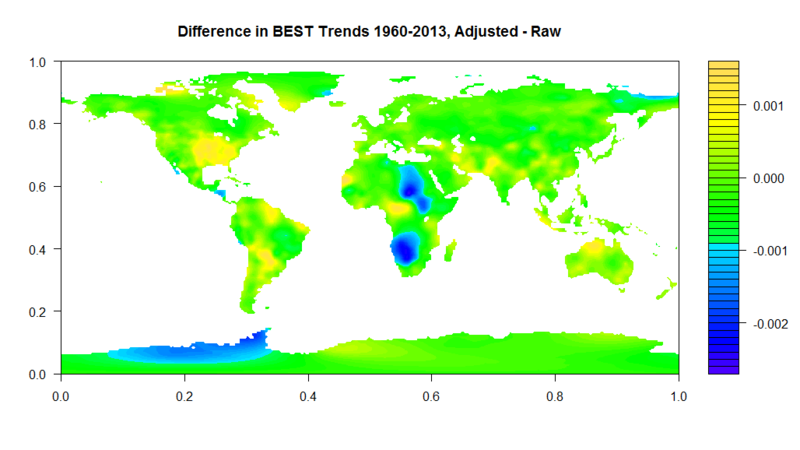 Where is GISS publishing both new and old ocean data? I would like to be able to keep comparing with the old numbers. But this is based upon a completely uncharitable interpretation of my post. I provided data in a gridded format as a map which cannot possibly be examined in a finer resolution then and referred to "locations." You had two options: 1) You could assume the word "locations" referred to the gridcells I was showing; 2) You could assume the word "locations" referred to something the data I provided couldn't possibly show. You chose number 2. You chose to interpret my word choice in a way that made my post sound stupid instead of pointing out something simple and obvious. I don't know why. I clearly intended meaning 1. Regardless, I'll be explicitly clear. When I referred to BEST saying no locations had cooled, I was referring to the gridcells it estimates. I suspect the same would hold true if one examined the data in a non-gridded fashion, but that's not the format I have the data in. That’s just fundamental. Instead of temperature suppose I gridded the weight gain of people in illinois and the average weight gain was 10 lbs per decade. Would that average for the state entail that every person had gained 10 pounds and that NO person had lost weight? This is just insulting. I've distinguished between station data and data for areas multiple times in the past. You know I'm fully aware of the difference between station data and estimates for an area. You had absolutely no reason to assume my use of the word "locations" was intended to refer to specific temperature stations. You've written two lengthy (for you) comments to me which are nothing more than you taking advantage of the ability to read the word "location" in more than one way. Coming here and copping an attitude because you can play stupid semantic tricks rather than try to understand people is just pathetic. Is that really how BEST is going to handle its public relations? MikeN, GISS has a number of NetCDF files available on this page. That includes land-only and the different land+ocean data set it's used. That's gridded data though. I don't know that it's publishing the results you'd get if you took an average across the data set. You could always do it yourself though. This isn't the first time Mosher has purposely misinterpreted your words, if I felt he was worth the time I'd find the posts on Climate Etc. I notice he didn't call you a Holocaust denier this time, so there's that. 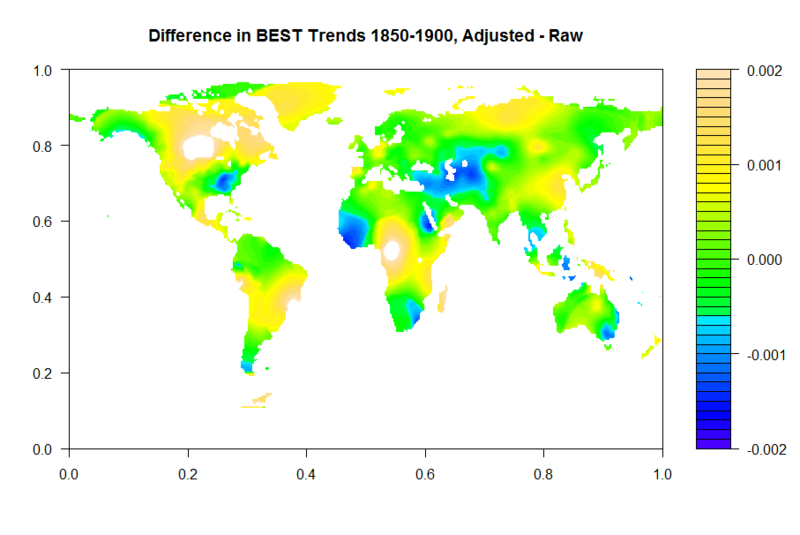 As Figure 1 illustrates the effect of adjustments on the global time series are tiny in the period after 1900 and small in the period before 1900. Our approach has a legacy that goes back to the work of John Christy when he worked as state climatologist: Here he describes his technique. But if you look at just the blue and red lines, you can see a .2 to .3 degree difference in the earlier portions. That means there’s a 15-20% change introduced by these adjustments. And that’s for if we only go back to 1850. 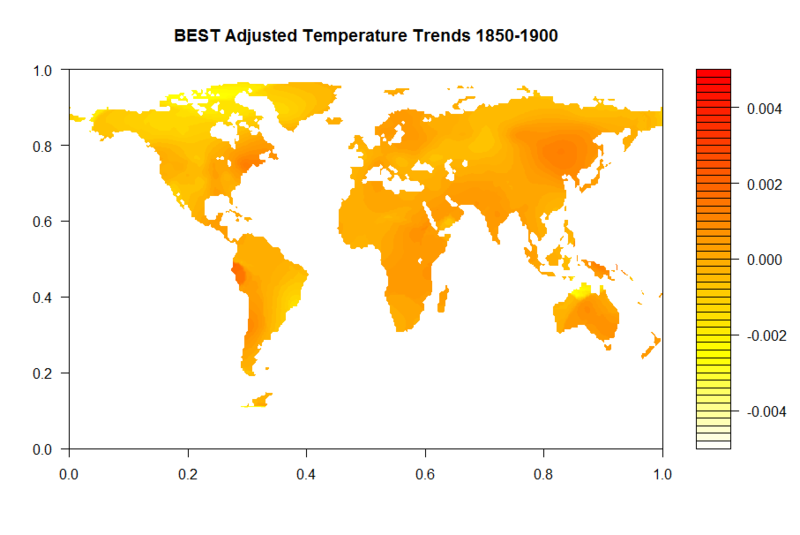 The BEST temperature record extends another hundred or so years back. We can’t see how much of a difference its adjustments make in that period. the blue line is the US 5% of the land. the POINT of showing people continents and how they differ is so that people will AVOID the kind of mistake Brandon just made. GLOBALLY ( we are estimating the GLOBAL average) the adjustments are mousenuts.. BUT because people can cherry pick ( the US) they can show BIG differences.. BUT they also IGNORE big differences in the other direction. It turns out Figure 4 in the post has results for individual areas plotted in different colors, with the United States plotted in blue and Africa plotted in red. So Mosher decided to act as though I was referring to it. Why? I don't know. Nobody with basic reading skills could possibly have come up with that interpretation. And let's not forget, Mosher frequently postures about how good his reading skills are. He often talks about how people can choose to interpret what others write in different ways, depending on how charitable they want to be. One would presume he would be able to understand when text explicitly refers to Figure 1, it is not referring to Figure 4. So maybe this is all intentional. Maybe Mosher is just a huge jerk who likes sabotaging honest attempts at discussions. Maybe BEST's public spokesperson is someone who actively tries to prevent people from understanding BEST. Or maybe Mosher is just a hypocritical idiot. I don't know. I can't say I care either way. Wow. Steven Mosher compared me to a Holocaust denier. Location and spatial averaging scale are two different things. You can average an area around your house of 1, 10, 100 or 1000m. You can do the same for your neighbor. For the larger averaging scales the answer will be very similar, but that does not mean that it is not a permitted and often insightful computation. Kenneth Fritsch, you mean the benchmarking of homogenization methods in the International Surface Temperature Initiative? The statistical modeling of the homogeneous data is ready. We have agreed on how to introduce the inhomogeneities into that. This August we will start implementing those inhomogeneities. When Thomas Fuller's bet with Joe Romm was being discussed at the BlackBoard, I said that he could lose on adjustments alone. Mosher then criticized me for thinking adjustments are biased, and said I should analyze them. Since then there have been two major adjustments on top of the minor adjustments, both of which had the effect of increasing the trend(although the first actually helped Fuller a bit). I wonder if Mosher thinks the latest adjustment is valid. 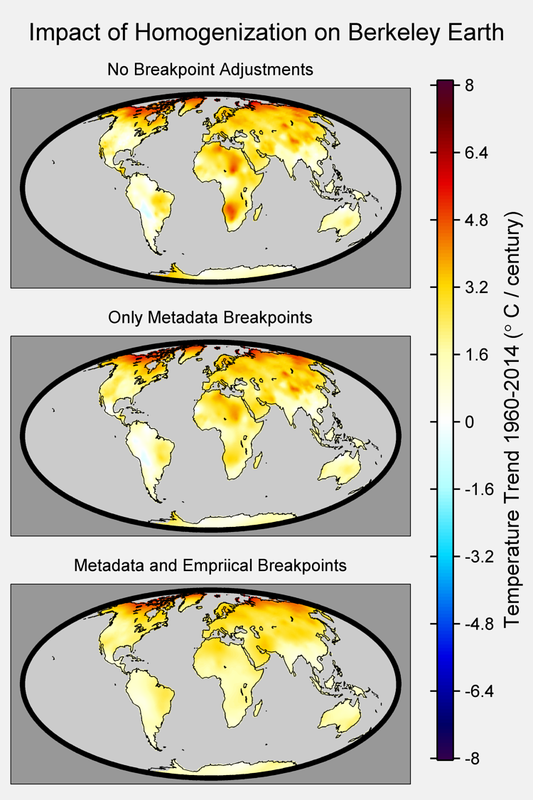 What introduces a distinct methodological bias in BEST's results is the reliance upon the bald assumption of spatial homogeneity of temperature variations over far larger distances than manifest in nature. Subsequent kriging to establish a continuous spatial field almost invariably winds up spreading UHI effects from urban data throughout the field. In many regions where virtually all stations are urban, the illusion is created of highly trending time series throughout the countryside. Lacking any thorough vetting to recognize UHI-corrupted records and removing them from the sampling scheme, the same problem is encountered in gridded treatments. Could you scale to 0.01 the maps for 1990-2013? I mean one colour for every 0.01 degree. I have no idea why you say this. It's true, but nobody had suggested otherwise. I guess you can chime in to say random things that are true but have no connection to the discussion at hand, but... I don't get the point. Yes, there can be reasons to smooth data to all sorts of different scales. There can be reasons to look at any given point in the resulting smooth (which is what calculating the average centered on your house or your neighbor's house effectively is). That has nothing to do with whether or not BEST's results have very poor spatial resolution for a temperature record - which they do. It also had nothing to do with whether or not BEST's poor spatial resolution may introduce biases into its final results - which is quite possible. And finally, it has nothing to do with whether or not I'm right to suspect BEST's choice of period for its regression is introducing biases into its final results (some of which BEST sort of admitted when pressed by me). But if you want to talk about it anyway, go ahead. I don't mind people talking about random tangents. Armando, I can see about doing that. I think I know how to do it, but I haven't tried manually setting the levels for colors in these before. I've only set the range of levels. It'll be a few hours though. I don't have the data saved from your run, so I'll have to rerun the code, and I'm heading out for dinner in about an hour. By the way, I can use different colors if you prefer. I'm using default palettes in R, but it's fairly easy to substitute in other colors. I'd just need to know what range. That goes for anybody. As you can see, limiting the levels like you asked impacts the adjusted map noticeably more than the unadjusted map. That's because of the reduction in spatial resolution BEST's adjustments cause. Before, I had set the levels as high as possible to pick up as much variance as possible. That favored the slight changes in the adjusted data set. I felt that was appropriate because it painted BEST in the best light possible (please forgive the pun). That's particularly relevant because of the short time period you chose. We expect a lot more "noise" with shorter periods for our trends than longer ones, so that's another choice which may well make BEST's spatial resolution appear greater than it is. If you'd like anything else made, feel free to let me know. Right now I'm going to go back to trying to figure out how to get those numbers on the bottom and left side not to show up. I know one way to remove them, but when I do, it removes other stuff I like. I really do not like the filled.contour command in R.
I wrote: "Location and spatial averaging scale are two different things." Brandon Shollenberger: "I have no idea why you say this." Brandon Shollenberger: "But again, I’ll point out BEST created a website which encourages people to look at its results on a relatively fine scale. Not only did it publish its results in 1×1 degree gridded files, it also created a website designed to allow users to select any location or even city to browse the temperature data for. By doing that, BEST portrayed its results to the public as having an incredibly fine resolution. " Could you plot a map with only two colours: one for below 0,001 and one for above 0.001? It should show some regional differences more clearly. Did you know? 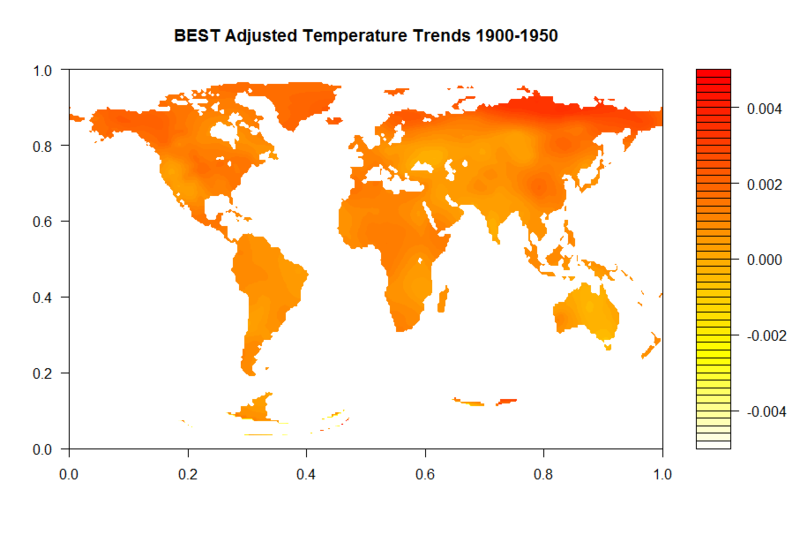 Berkeley Earth gives you historical temperature data for your home town, state, and country. Check out our Results by Location page to learn more. That is the BEST website, explicitly saying you can get the temperature data for your home town from the tool which really just gives you results for a very large area centered around whatever location you pick. In other words, that is BEST explicitly telling its users something untrue. My criticism been quite clear. I have not criticized BEST for providing a tool which lets the user find results for a large area centered on the location of their choice. I have criticized BEST for having far worse spatial resolution than other groups (e.g. GISS), and I have criticized BEST for portraying their results as having far greater spatial resolution than they actually have. Your commentary on their tool does nothing to address any of my criticisms of BEST. That their tool could be defended for a use other than the one they advertise it for does not make their statements regarding it less false. Nor does it make the fact BEST has terrible spatial resolution less damning. Armando, I can do that. I doubt there will be much difference between the raw and adjusted results though. I'll try to get it done after lunch. Alright, that took a bit longer than I expected due to a weird bug. It took me a while to realize what was happening. I had written some code to handle the level settings automatically so it would be consistent when I made multiple maps for one period, and it worked fine before. I had never thought to try it with only two levels before, and it turns out one of the lines in it will end up dividing by zero if you only use two levels. That led to a variable not getting changed when I reran the code, keeping the value from a previous run and causing weird issues I couldn't identify at first. Oh. Apparently I set the breakpoint at 0 not 0.01. I can rerun it if you'd like. It won't be until tomorrow though. I have another project I'm working on in R right now, and I don't have the memory to spare to load the BEST data while I'm working on it. For what it's worth, this is actually really quite easy to do in R. I can provide some simple code that'd walk you through it. The scale has to be from - 0.002 to + 0.002 with four colours please. When I have time I'll learn R.
Just a thought, since I know you try to be a stickler for accuracy. When you have time you might consider doing similar station comparisons with Berkeley raw data. Probably take a couple hours to run through the 32000 stations. Age is slowly ossifying my brain, so I'm not really into taking on and coding for another database. I don't know if it makes much difference globally, but months ago I told GHCN about it and their new V3.3 data still has almost all the same duplications. They did condescend to correct one of the most egregious(10 years) duplications between two stations 100 miles apart and a 3000m difference in elevation. Had a rather unsatisfying discussion about duplicate data with Mosher a few months ago in this thread. Here are two station pairs in Berkeley with decade long duplication. Bob Koss, thanks for letting me know about that. I know I've heard about such duplication problems before, but I don't think I've ever looked into them at all. Unfortunately, the material I'm working with won't let me look into that. What I'm looking at is the gridded results you get when BEST finishes its calculations, both with and without having adjusting its data. Gridded results obviously won't let me see duplicated stations. I do, however, have the raw station data BEST uses so I can look for duplicated data. It would probably be something I'd want to do a bit later though. I'm a bit behind on doing stuff with this data set (I haven't forgotten you Armando). 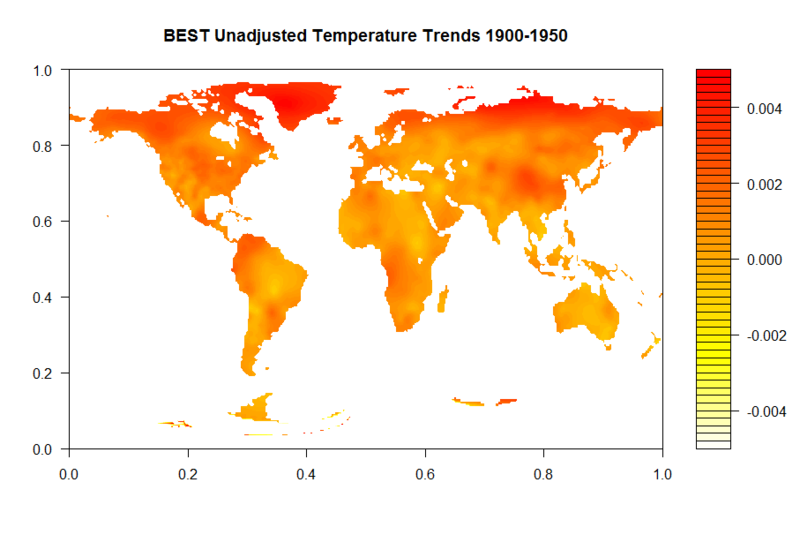 I want to get a file together with a difference map showing how much BEST's estimates for the temperature of the planet, laid out on the map, change due to their adjustments. And I want the file to show it for the entire record. That's not hard to do, other than being a huge memory sink, but then I want to make a video so people can see the changes visually. I'm hoping to get a first pass of it done by the end of the month, but that might be overly optimistic. But once I do that, I'll probably be done with looking at these files for a while, so looking at the raw data could be next. At your convenience, Brandon. It is just a suggestion. I don't work with Berkeley, just figured I'd give you a heads-up about the problem. I made maps of GHCN v3 station trends (and ERSST) here. They are raw stations, linearly interpolated with shading, so of course there are lots of negatives. The US is particularly variable, which I think is partly the TOBS effect. Switching to adjusted makes it smoother. Re Bob Koss, I have found lots of junk in GHCN unadjusted - eg La Paz, June 2010, 86°C. But they are mostly flagged. I remove all with QC flags; it isn't a lot, and I haven't had problems with the rest. Thanks for the comment Nick Stokes. I've never been big on visuals, so that's a much better display than anything I'm likely to create. I have some other thoughts on the topic, but I have no motivation right now. I've stayed offline for most of the day because I'm still flabbergasted over the recent situation with Retraction Watch, and I just don't feel like doing much of anything. Armando, I promise, I haven't forgotten! I'll get that done this evening. Just to make sure, those numbers are monthly trends, right? I think my previous ones may have been yearly. I'd have to check. I've been using whatever R sets for its default when doing linear regressions, and if I remember right from the last time I was making these maps, it doesn't default to monthly for some reason. I can reduce the range further, to as small as you had requested, but... it's not going to look pretty. I'm looking at it on my screen right now, and half of Europe, Asia and Africa are all missing. A large part of Canada too, as well as a bunch of other places. You can envision what it'd look like by imagining if two of the colors in the images above were erased. That's what you'd get. I think you might want to tweak your request. It's o.k, but could you do these maps with 8 colours between -0.004 and 0.004? I'd like to see the change in steps of 0,001 degree. No prob Armando. Let me know if there's anything else you'd like me to do. Things have calmed down for me now, so I should have more time to work on projects of my choice. There has actually been a bit of a story I've been working on behind the scenes on top of everything going on with Retraction Watch, but I think the most time consuming aspects of it are about wrapped up. This was just before BEST released their data and I forwarded the results to Richard Muller who confirmed that he agreed that one third of stations are cooling. In recent times Mosher then put on lots of caveats minimising any cooling. Perhaps I should ask Dr Muller again directly for his current position on the significance or not of any cooling? 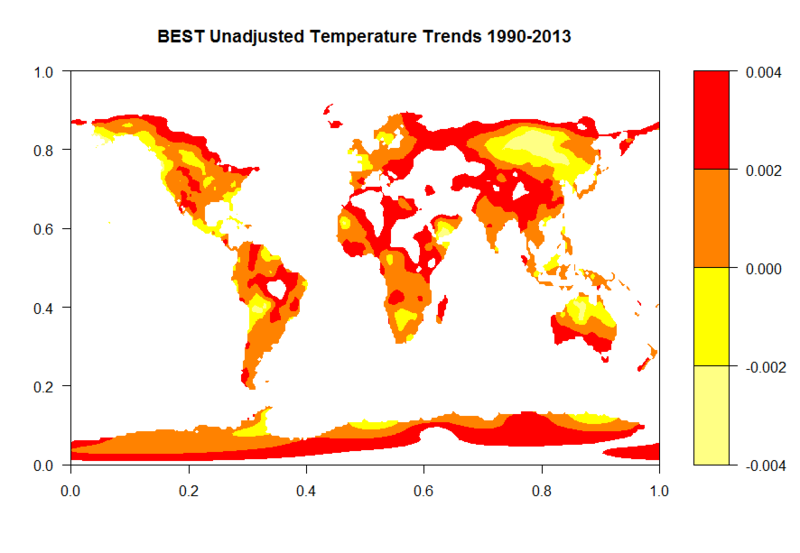 Statistically meaningful cooling seems to me to be a very important aspect of Global warming. tonyb, I think it would be interesting to get his position on any number of things given his public statements regarding BEST have had a tendency to be, shall we say, not accurate. But seeing as BEST is perfectly aware of his misstatements yet chooses not to correct any of them, I wouldn't count on getting a straight answer from him. I mean, seriously, if I hadn't pressured BEST, how long would it have taken them to release the results I discuss in this post? These aren't even their complete results sans adjustments, and yet, this partial release came months after BEST told everybody the full release had already been made? And it only came after they were pressured to? What kind of nonsense is that? If Hadley had done it, Mosher would have included it as an example of dishonesty in his book. Instead, he'll defend it even though it's BEST flat out lying. But... bleh. I don't feel like dwelling on that right now.